The following is some of the story of commercial bouillon, first invented by Liebig, which then became Oxo, Marmite etc. and the beautiful printed images they used in their advertising from about 150 years ago. The Liebig trading cards came in a set of 6 with each bottle of extract. There were over 11,000 different cards of varied topics. was a German chemist who made major contributions to agricultural and biological chemistry, and worked on the organization of organic chemistry. As a professor, he devised the modern laboratory-oriented teaching method, and for such innovations, he is regarded as one of the greatest chemistry teachers of all time... He also developed a manufacturing process for beef extracts, and founded a company, Liebig Extract of Meat Company, that later trademarked the Oxo brand beef bouillon cube. He invented Marmite too. Marmite (a French term for a large, covered earthenware or metal cooking pot) is a by-product of beer brewing. The Liebig Extract of Meat Company was the first to commercially create and sell bouillon, a meat extract, which in a time before refrigeration, before all the technological advances that we take for granted today, was a big deal. It meant that soup, gravy or stew, using a meat stock base, could be made almost anywhere. This bouillon was also portable, practical for camping, during times of war, when traveling or living in other countries. To get the idea of bouillon's uses across to customers and to offer an incentive for buying their product, the Liebig Company created a marvelous series of trading cards over many years. For most of the images they used a type of printing called chromolithography. The initial technique involved the use of multiple lithographic stones, one for each color, and was still extremely expensive when done for the best quality results. Depending on the number of colors present, a chromolithograph could take months to produce, by very skilled workers. How to tell a chromolithograph. Years later the Liebig Company then merged with Campbell's Soup Company. Both the Liebig Company and Campbell's created their meat extracts in an oddly named city, Fray Bentos, in Uruguay, South America, about 150 years ago. Fray Bentos translates as meaning Friar Bentos. The city of Fray Bentos was founded in 1853 and was built to accommodate ships of heavy tonnage, that could not make the port city of Gualeguaychú. It was officially founded April 16, 1859 under the name of Villa Independencia by the Uruguayan authorities. Despite the arrival of large ships, the city remained a small town, quite destitute, it owed ​​its vitality to the institution on a hill overlooking the river, a food manufacturing company. The name Fray Bentos apparently came from the religious group sent by the Argentine government in 1620 to educate the natives. The name was taken over by the people who worked for the Liebig company, later to be merged with the Campbell's Soup Company. The economy in Fray Bentos was based on the meat production until the closing of the plant, which was the largest in the region up until 1979, when the plant closed. Concerning the slaughter, the cattle were herded into fenced meadows, the company did not use calves, or heifers nor cattle below four years of age, with the idea of using only the best meat. 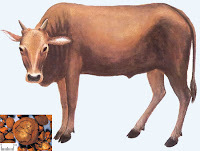 An animal of quality would produce an extract that was strong and healthy. At the slaughterhouse, the cattle were brought into the corrals, solid enclosures, the largest of which could contain five thousand head of cattle at a time. First the animals went through corridors that were successively narrower until they could walk only one at a time. Once there, the animal was immediately struck by a knife which made it fall on a moving floor running on a railway that lead immediately to the right place to be skinned and cut, while in turn the other animals underwent the same treatment. In a plant where cleanliness was required, abundant water was essential. The nearby river satisfied this condition and by means of a powerful machine water was pumped into a huge iron tank with a capacity of 30,000 hectoliters, driving the entire establishment. The Liebig plant in 1880 covered an area of nearly 3,000 square meters and was located next to a building containing eight huge boilers. A railway connected the slaughterhouse to the factory and served to bring the meat in a well ventilated and well lit way, to the place where it wass reduced to pieces by slicing machines, four in number, it then passed into the wrought iron tanks, which could contain up to 5,000 kg of meat each. The high pressure steam triturated the meat that arrived in a liquid state, was conducted through pipes via the apparatus, which were the invention of Professor Max von Pettenkof, in which the fat separated from meat. There were then also clarifiers that separated albumin, fibrin, and phosphate of magnesia, the result was a liquid that lead to an evaporator through multiple filters. It then continued to the crystallization process and packaging.Chemists regularly checked the quality of the product before this last operation. The product was shipped to Antwerp, where samples would be checked again. The extracts were packed in tin cans manufactured in a factory next door. The fuel used was coal, imported from England, also used to supply a nearby factory that produced, with the animal waste, a nutrient rich fertilizer, needed in Europe for sugar beet crops especially. In 1964, Foot And Mouth Disease and typhoid hit the area, contaminating the Fray Bentos corned beef. Investigations revealed that the cooling water used in the process of canning factory was not always chlorinated. In economic terms, at the same time, the entry of Britain into the Common Market affected the circuits of import and export. These factors combined had a serious negative impact on sales, and in 1971, the industrial complex was handed over to the Uruguayan government. The viability of the plant was never recovered and production ceased completely in 1979. The complex currently houses an industrial museum. Liebig's meat extract looked like a dark molasses packaged in a white opaque glass vial, containing meat extract and salt (4%). It took 3 kg of meat to create 100 grams of extract. The product was enormously popular. In 1875, 500 tons of extract were produced in Fray Bentos annually and over during the next fifty years. It became a staple in middle class European households and military, including the allied forces of World War II. It was even used by European adventurers, such as Sir Henry Morton Stanley on his trip to Africa. It is still being sold in original packaging by Liebig Benelux. In 1873, Liebig began producing canned corned beef, sold under the label of Fray Bentos. Later, freezing units were installed, allowing the company to export frozen and refrigerated raw meat. 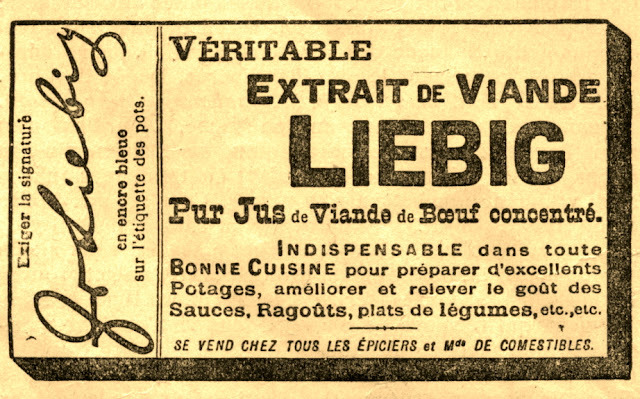 A cheaper version of Liebig's extract was presented as Oxo in 1899. Later, the stock cube Oxo was introduced. Liebig also produced a range of organic products under the name Oxoid (from 1924), especially glandular extracts. In the 1920s, the Company acquired the Oxo Tower Wharf on the south bank of the Thames in London. They built a factory on the banks of the river. Liebig's meat extract company was purchased by the Vestey Group in 1924 and the factory was renamed El Anglo. Liebig then merged with Brooke Bond in 1968, which itself acquired by Unilever in 1984. After many years the small western Uruguayan town of Fray Bentos is once again exporting the product that gave it name recognition around the world: corned beef. "I was brought up on it. I remember eating corned beef until it came out of my ears," said Prince Charles during a visit to Uruguay in 1999. Such was its importance as a food exporter that the town was once known as "The Kitchen of the World". "Before the English arrived we only slaughtered the cow for its hide, tongue and some cuts of meat," he said. "Then we learned that there was a market for each by-product. France bought bile stones for the perfume industry. Thick ear hair made into brushes, there were unthinkable uses." And here are some of the beautiful chromolithograph trading cards that came with the Liebig meat extract package. There were over 11,000 of these cards, in many languages. They are collected by many and can be found all over the internet. The wonderful art work depicts many topics, including themes in history, animals, books, operas, scenes from all over the world. The cards represent a cultural insight in the period. For a long time in a era pre television, the cards were used not only for decoration but contained information on a wide range of subjects, acting almost like an encyclopaedia. So the Liebig cards for a long time played an educational role to many pre audio-visual societies. Oh, thanks SO much for saying that Fri! Much appreciated. Using Car Rental 8 you can discover the cheapest car hires at over 50,000 locations globally.